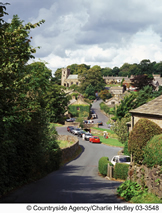 The built heritage of the Forest of Bowland comprises a series of small and medium-sized villages, a fairly even scatter of individual farmsteads, and a significant number of larger gentry houses. The ample supply of local materials, chiefly pale and golden sandstones and pale grey limestones, has meant that the vast majority of the older structures are stone-built and many have (or originally had) stone slab roofs. Structures of well-dressed rectangular blocks, of more roughly dressed but still squared stones, and those of coursed or uncoursed rubble construction can all be found. It is notable, however, that few of the local limestone beds are suitable for high-quality masonry and the stone is often hard to dress cleanly. In these areas rubble construction tends to predominate, with lintels, sills and other important or decorative items may be made of ‘imported’ sandstone. No locally distinctive style of building can be readily identified, except to note that buildings are often fairly plain and with plain squared door and window surrounds. Earlier buildings may have chamfered stone mullions in their windows, or traces of them having been removed. Datestones are reasonably common, however, particularly on the northern and western side of the Forest. 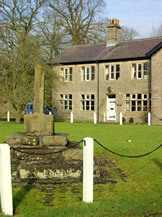 A fairly distinctive ‘Lune Valley’ style of datestone, with a stepped or castellated outline can be seen in villages such as Wray. If one discounts the religious buildings and the higher status houses and halls, few of the buildings of Bowland have been identified as of 17th century origin, and fewer still pre-date this. It is probable, however, that many of the existing early buildings are replacements or rebuildings of earlier structures but it would also be true to say that the status of the area as a Royal Forest (a hunting preserve, not necessarily an area of trees) would have severely limited settlement and construction until at least the mid 16th century. 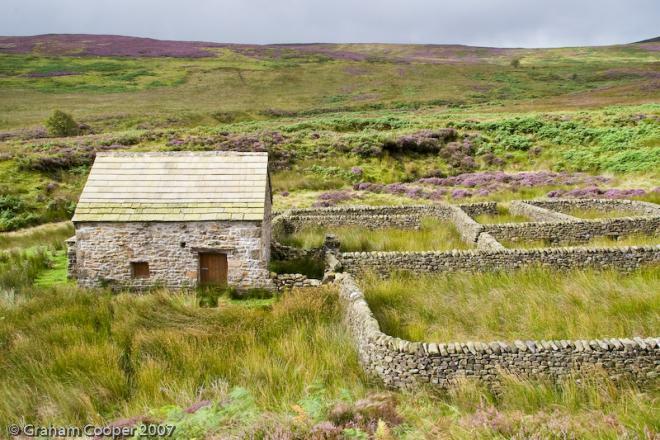 Farmsteads generally comprise a collection of individual structures, often around a farmyard, as opposed to the ‘laithe-house’ style seen more commonly in the Pennine areas, where the farmhouse and barns are built next to each other under a single roof. Barns are often of a ‘combination’ type, both housing cattle and providing storage for crops and fodder. The classic ‘Lancashire’ barn can often be seen with a pair of opposed cart doors centrally and a cow house or shippon at one end, accessed by three doors through the gable end and with a hay loft over. Specialised buildings such as granaries are rare, but most farms had a dairy and until World War 2 local cheese production was common. Outbarns on the higher land and in summer pastures were also fairly common, although the economies of farming have meant that many have fallen into disrepair in recent years.